s.B>C is now a target combo. Follow ups possible after it hits. Producer Yamamoto says: "Aside from being a good way to disrupt guard, his punch super can be used effectively to catch opponents who roll past his fb. His fb game has improved and can be used as a central strategy now that the recovery is better. His air qcb.P can be cancelled with any special and the new s.B>C target combo can be linked by following with c.B or s.D. I recommend using these changes aggressively along with his fb whilst minding distances." Kensou is a somewhat different beast, especially now in Console XIII. He a character that is not a master of any discipline but can really hold his own in any. He's a very capable zoner and has the ability to rushdown and pressure well, however his stubby normals and the fact that people can start negating his zoning once meter is gained really hammer home the point that he is not meant to excel in any particular area. Success with Kensou is achieved by knowing when to enact a rushdown or zoning style and when to incorporate his normals and moves that have their specific niches. Good fireball and DP lend him a solid zoning game. Thanks to his dive bomb and backflip, he has a number of different movement options to keep the opponent guessing. His rekkas can get the opponent to the corner very quickly. Thanks to his Target Combo, he has incredibly easy hitconfirms even into HD mode. All his air normals have the potential to crossup the opponent. He has somewhat stubby pokes so he's not as adept within footsies. He has a floaty hop arc making it very difficult to enact a high/low game. Damage outside of the corner, even in HD is not terribly effective. s.A: 25 damage, cancel-able/chain-able, hits mid. Kensou throws a short jab. It's not a terribly decent move, it's not very good at a st.A's usual niche as a hop check. It hits crouching opponents and you can use it somewhat with cl.C as a frame trap but confirming would be difficult. s.B: 30 damage, cancel-able, hits low. A very solid move. As you can see, hits low and it can go into his st.B, st.C target combo which can eventually hit-confirm into Rekkas or his DP. Range is also not bad for a st.B. You can also cancel into specials out of it, but you probably won't use it much for that. s.C: 80 damage, hits mid. Second part of his target combo, Kensou throws an overhand punch. Despite the animation, it's not an overhead. Outside of the Target Combo there's very little use for this move. At the activation range this comes out in, Kensou will be too far away to link anything afterwards. Not cancel-able into anything but HD, this makes it a very mediocre move outside of his Target Combo. Avoid usage. s.D: 70 damage, cancel-able, hits mid. Outside of his DP's, probably Kensou's best anti-air. Kensou kicks the air in front of him. Unlike most, Kensou does not have a separate close or far.D move so this activates from any range. Great vertical range with the ability to cancel into specials, most notably his backflip and fireball. It lacks a bit of horizontal range so be careful of whiffing the move, but it is also whiff cancel-able so you can make it somewhat safer than other whiffed normals. cl.C: 70 damage, cancel-able, hits mid. Kensou throws a stiff chest/gut check. It's a quick move, good for punishing. Other than that, there's not a ton of use for it since due to the absence of a command normal, hit-confirming off of it isn't the easiest thing. Save for punishes and option-selects with throw. cr. A: 25 damage, cancel-able & chain-able, hits mid. Kensou flicks his fist in front of him. A much better check against hops than his st. A, this fills up that niche decently. Quick to come out and defends the area in front of him. This is the only usage of it though. cr. B: 30 damage, cancel-able & chain-able, hits low. Arguably Kensou's best poke, a very quick low that's cancel-able into anything. Chaining this into itself is going to be your best hit-confirm along with your Target Combo linking into this. The range isn't that impressive, but it gets the job done. You'll be hitting this button a ton within a match. cr. C: 70 damage, cancel-able, hits mid. Kensou's second best Normal Anti-Air. He throws both hands out in front of his head at an angle. A bit better of a horizontal Anti-Air than st.D but serves around the same niche. cr. D: 80 damage, cancel-able, hits low. Kensou's sweep. Amazing poke, good range, special cancel-able which makes it deceptively safe thanks to his fireball and backflip. Thanks to his tools, this is one of the better sweeps in the game. j. A: 45 (40) damage, cancel-able, hits overhead. Kensou thrusts a palm at a downward angle. This is his best vertical hop-in move. You can also hit it decently high and still combo after it. 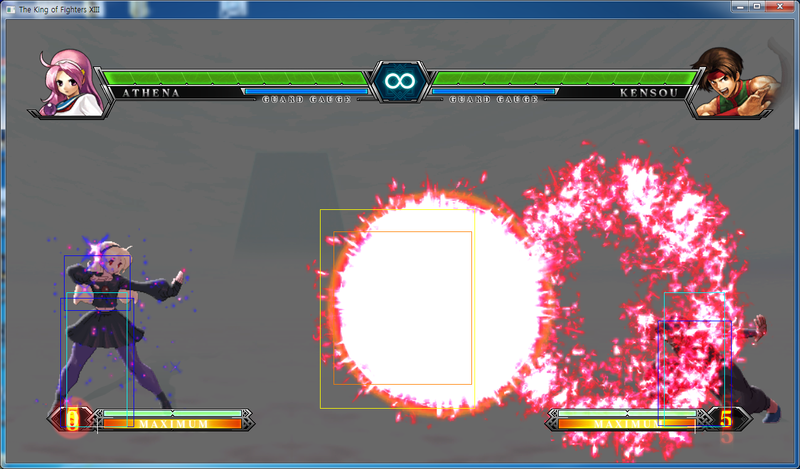 Also if spaced perfectly, it can even crossup the opponent, and the setups for doing so aren't too difficult. Solid air normal. j. B: 45 (40) damage, cancel-able, hits overhead. Kensou sticks his leg out like a flying kick. One of his two good air-to-airs. Comes out quick and has a solid horizontal range, letting it snipe the opponent before they can stick out a normal. It's not a bad air-to-ground move either, it hits crouching opponents and has a better crossup hitbox than j.A and is much easier to set up in order to crossup. j. C: 72 (70) damage, cancel-able, hits overhead. Kensou leans into a flying elbow. It's not a terrible move, it's a decent air-to-ground, however Kensou's hurtbox comes lower than it so it might be a problem. It also has the ability to crossup if done very, very late. Its active frames are not great. j. D: 70 (68) damage, hits overhead. Pretty much Kensou's st.D but in the air. His other good air-to-air, but for different reasons. This will beat out almost anything the opponent throws at Kensou if he's above him. Along with j.B, this makes him very annoying to deal with in the air. And, another note, like the rest of his air normals, j.D can ALSO crossup, but again, has to be done relatively late and you'll probably never use this as an air-to-ground so it's more for novelty. CD: 75 damage, cancel-able, hits mid. Kensou thrusts his fists out in front of him as he takes a forward step. Not the greatest CD to write home about, but it has one good advantage. Kensou can take advantage of the great forward motion and whiff cancel it to gain ground. Can make pinpointing him very tricky. Won't use it often but it's good to keep in mind. j. CD: 90 (80) cancel-able, hits mid. Kensou does an arching kick. It's a solid air-to-ground j.CD. Good angle and the active frames are EXTREMELY deceptive. The opponent can still get hit for a bit after the animation ends. And of course, being a Kensou air normal, it crosses up though it's the hardest one to get to do so, and since it has to to be done so late, it defeats the purpose. Kensou does a backhand palm, knocking the opponent away. Normally wouldn't be much to talk about, HOWEVER, in this version of XIII, Kensou can combo off of it in the corner, preferably into his DP, or more preferably his EX DP. Add a drive to it and you've hit for 30-40% and depending on your ender, a hard knockdown to continue your pressure. This makes Kensou EXTREMELY dangerous in the corner. It's highly recommended to master the art of running into throw so you can maximize its usage in your pressure. Kensou's backflip (obviously). It's cancellable into specials and DMs until right after he touches the ground with his hands. Kensou has a bit of invulnerability right at the start to get around loose blockstrings. But this gives Kensou a bit more mobility and trickiness as he can cancel normals into this as well. Making it so you don't know when he'll go straight into a special off of normals, or into this into a special. Do not abuse this too much however. Someone like Shen can EASILY punish this with his Gekiken if he can react to the backflip, and he's not the only one. Solid move when used in moderation and interchanged with other specials. Chokyudan = (qcb+P) - Electrified ball of Psycho Energy. A has quicker recovery and goes slower across the screen. C goes faster and has longer recovery. (EX) = qcb+AC - Much faster version with more durability and damage. One of the staples of Kensou's offense. This fireball has a solid hitbox, good differing speeds, and the A version gives him solid pressure in the corner. Can be used as juggle filler as well. Can be used after Rekka finishers to force the opponent to block after they get up. All and all, this is Kensou's best tool, use it often unless facing someone that can destroy your FB game. Ryuutouda = (qcf+P) - First hit of Kensou's Rekka Series. ∟Ryutetsushou = (qcf+P) - Second Hit of Kensou's Rekka Series. ∟Hasei Shitsukuu Zanryuu = (qcf+K) - Last hit of Kensou's Rekka series. Kensou's almighty Rekka series. Hopefully you'll be landing this a lot during a match as it helps set up and keep his offense, especially in the corner. A/C version are pretty much the same while the EX version does a 5 Rekka series. All his Rekka series end in a Hard Knockdown, easily allowing Kensou to setup any offense he wishes. Easily hit confirmable from his cr.Bs. Only two weaknesses. One, Kensou is not Fei Long from SF, his Rekkas are not that safe, avoid getting them blocked if at all possible. Secondly, his DP+P move might come out by mistake. All in all though, a necessary tool. Ryubokko = (dp+P, [P]) - A Rapid String of punches that can be mashed for more hits/damage. Kensou's rapid punches. Yeah, this move is not very good at all. Usually the only time you'll see this move come out is if you messed up your rekka input. It can be mashed for more hits and different properties. If you mash a couple of extra inputs at least it's safe on block. A couple more (about 8) and you do a finisher hit that knocks the opponent away. Too many and Kensou gets tired out and is so wide open, you might as well start recording your opponent's impending combo video. So again, avoid using if at all possible, and if you mess up, add a couple of inputs to make yourself somewhat safe and pray your opponent doesn't Guard Cancel Roll. Ryugakusai = (rdp+K) - Kensou's DP/Dragon Kick. D version has more horizontal movement, hits and vertical reach than B. (EX) = rdp+BD More horizontal movement, more hits, a lot more damage. Kensou's DP which is another important part of his play, more specifically his B DP and his EX DP. His B DP is his standard reversal, some invulnerability and it comes out at a decent start-up, and it's part of his HD loop in the corner. It's also likely the DP you use to maintain spacing and zoning when using your fireball game. EX DP however, is the most damaging special you have. Use it off of Drive Cancels from your Rekkas, or preferably in the corner after a throw or during an HD combo. Try to avoid using any other DP than B for reversals, the other two start up with horizontal movement and aren't immediately active so you won't be happy. 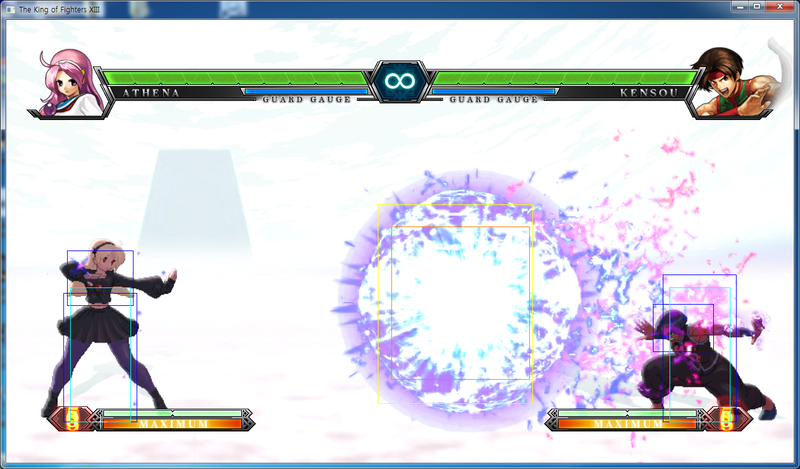 Ryusogeki = (qcb+P) in air - Kensou Dive Bombs forward. Button determines the steepness of the angle. (EX) = qcb+AC in air - Kensou's Dive Bomb now does multiple hits on the opponent and keeps them standing instead of causing a Soft Knockdown. Kensou's Dive Bomb isn't the best move in his stable, but it serves its niche decently enough. Makes him less predictable in the air and more leeway to avoid things like projectiles. However, the normal versions of the move are terribly unsafe on block. If you're going to launch it, better make sure it hits, or it whiffs, otherwise you'll feel pain. His EX version is interesting, it's a lot more safe on block, and when it hits it does a variable amount of hits (depending on how deep you landed it etc) and gives you frame advantage afterwards to link a normal and continue a combo. It helps to have around as just another move. Sikuzanryukyaku = (qcf+K) - Kensou runs forward and when close enough to the opponent, he jumps and kicks him in the face. Button determines the distance he runs. 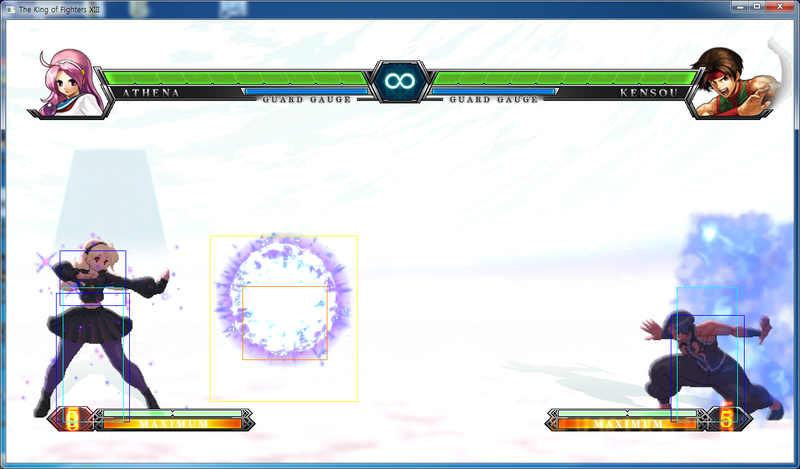 (EX) = qcf+BD Kensou immediately leaps forward and does the kick from a good length away. The third part of Kensou's Rekka Series, but standalone and...there aren't many uses for this move, considering how unsafe it is on block. EX Version could be used to catch an opponent trying to avoid your fireballs but, all in all, use sparingly if at all. Super Chokyudan = (qcbx2+P) - Kensou fires a huge Chokyuudan forward. Button strength determines the speed of the projectile. A is slow, C is fast. (EX) = qcbx2+AC - Chokyuudan turns red and flies forward at an EXTREME speed. Kensou's FB DM. It's a solid move that adds more dimensions to his FB game. With its much bigger hitbox, this DM is much more suited to dealing with hops and jumps than the normal FB whereas things like the EX normal FB is better for beating out normal FB wars. The C and EX version of this DM do come out fast though so you can use them if you feel like it, but it might be a bit tougher to do on reaction. Also, due to the big hitbox, the A version can be used to get in on your opponent pretty easily, just don't run into an invincible move for no reason. It won't be used a ton, but it has good uses. Super Punch Drill = (qcf~hcb+P) - Kensou does a quick palm strike in front of him breaking his opponent's guard, then ravages the opponent with 50 punches, the last sending him flying. Kensou's Super Punch Drill has changed dramatically from the Arcade. 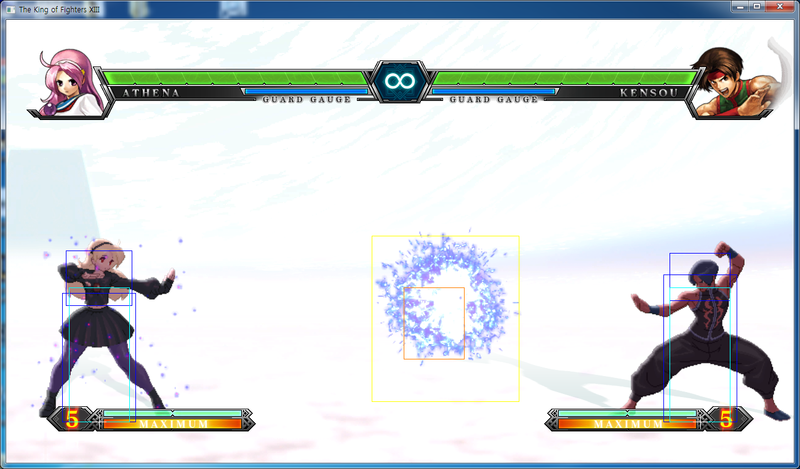 It's now a 1 Frame Command Grab, and as such, not completely worthless. It adds another dimension to Kensou's offense not previously seen, and supplements the fact that his hop arc makes it a bit tougher to enact his high-low game. Now this DM has one big weakness...its range is absolutely pathetic. You have to be pretty close to get it to land. However since this isn't something that his game is really built around, it's not that big of a deal. Use it to scare the opponent out of turtling up. Seigan Senki Hakkei = (qcfx2+AC) - Kensou gathers his energy then fires a big electric buzzsaw right next to him. Kensou's NeoMax. Not too much to say about it, in terms of utility there's not much it has other than possible chipping, but probably best to avoid using it for that purpose unless you know you'll get the kill. In your HD combos, it's there to add a ton of damage. (LO) = Link only, not a frame tap. 1.) st. A > cl. C - 3 frame gap between st. A and cl. C. 3.) st. A > cl. D - 4 frame gap between st. A and cl. D. 5.) cr. A > cr. C - 3 frame gap between cr. A and cl. C. 6.) cr. A > cl. D - 4 frame gap between cr. A and cl. D.
Kensou has a decent amount to do here. Throwing Chokyuudans and mixing up speeds will be the main ones. He can react to any fireball with his EX Chokyuudan and probably will connect with it so he can gain some easy ground. Or he can just throw an A Chokyuudan or A Super Chokyuudan in order to move in on his own pace. This is where Kensou has to mind himself. You can still throw Chokyuudans but now they're much more likely to get you killed if you throw one at the wrong time. He can st.D, cr.C or DP any bad hops or jumps on reaction which can let him dictate the pace. However, do remember his normals are stubby so you'll likely lose any meticulous footsie battle. cr.D will be your best friend here, it's your best poke. You can take a risk with his QCF+K to beat out any lows, but again, it's a risk, punishable by death. Unsurprisingly this is where Kensou can shine. A plethora of cr.Bs, Target Combos, Backflips and Choukyuudans are preferred, and confirming into Rekkas whenever possible. All your air normals can crossup, use that to your advantage with setups. Don't be afraid to try and get them with the Super Punch Drill to lower their guard. Ah yes, the beloved corner, and where Kensou makes an even bigger splash. Do all of the above, along with mixing in normal throws for major damage. Also any time your Rekka finisher lands, you have a free meaty A Choukyuudan on them on wakeup (unless they have an invincible reversal). Abuse them here, do not let them out of this corner. No rocket science here, get out of there by any means necessary. B DP when you have an opening, GCR or GCCD, or if they're far enough away, get a EX Choukyuudan to hit so you can gain immediate ground. When Kensou has neither of these, his options are slightly limited but still solid. Choukyuudan zoning and pressure are still your main tools, but you will not be winning any FB war without that meter. Zoning's still decent as you have your DP's behind you. Kensou's damage is very mediocre without meter, so annoyance and lockdown in the corner is essential to rack up the damage. Also, without meter or drive, the threat of Kensou's throw is not a big deal at all, only really getting a D DP at the end. This means you'll have to rely on your Choukyuudan pressure and your high/low game to land decent hits, which can be tough considering Kensou's floaty hop arc. While Kensou may not be at his best without resources, he THRIVES on the opponent not having them as he can annoy them to absolute death. When Kensou gains meter, now he gains a lot more fluidity in his playing style. Actually winning a FB war becomes a lot more possible with the boon of his EX Choukyuudan burning through opposing FBs. His Choukyuudan DM also helps to be a decent AA FB for the war, keeping the opponent guessing. EX QCF+K will also help the zoning game by punishing bad rolls and possibly a few things he wouldn't be able to punish on block before. Also, now with the meter, Kensou's throw game becomes a lot more dangerous for two reasons. One, now he has access to his Command Grab DM opening up any turtle attempts and granting him the ability to punish anything negative on block if the opponent is close enough. And two, now he can hit the opponent with his EX DP after a throw opening the opponent up for around 30-35% damage. The main thing here though is to use the meter wisely. It's very tempting to burn it often, but it's usually not worth it. Know when to use it in each situation and the pay off will be great. Kensou with only Drive can't do anything much that he can't do normally. He doesn't any effective Drive Cancels midscreen without meter, and his HD combos without meter are severely lacking and a waste. Really the only thing Kensou gains with Drive without meter is something to do after a normal throw in the corner, but it might be best to save the Drive for when you do get meter. With both options open Kensou gains a bit more leeway, however his game doesn't open up as greatly as the gap from 0-1+ meters would give anyway. Essentially, now Kensou gains a decent Drive Cancel midscreen from Rekkas to EX Rekkas/DP. Now, preferably you could do that without the Drive Cancel, but it gives you plenty of hit confirm time and a slight boost in damage so it doesn't hurt. EX Rekkas is the preferred of the two to go into because while the EX DP provides slightly more damage, EX Rekkas involves more corner carry and that crucial hard knockdown. Kensou gains a solid HD combo option for two meters that's an easy 700+ damage from an easy hit confirm, but it isn't anything truly special. In that great corner though, this is where Kensou gets the best boost from it as now his normal throw is one of the scariest things in the game. Possibly 40-50% off of a normal throw right back into a hard KD for 1 Meter/1 Drive. This becomes the main reason for the opponent to fear Kensou's corner game as one wrong move means he can lose 30-50% from any of Kensou's options. Point Position/1st Character. While Kensou can be pretty flexible on a team order, point character is where he can shine for a couple of reasons. His zoning game becomes a lot harder to deal with without meter granting more options around it. His pressure is also annoying due to the lack of resources preventing the usage of Guard Cancels. Things like a lack of poke range and such becomes less noticeable, and he can put any meter build to work quickly, while at the same time he doesn't completely live on things like Drive. When put in later in the order, his zoning game becomes less and less effective with more options open to the opponent, and his damage isn't impressive or quick enough to really be put back in positions like anchor too often. You can move him around as matchups demand (for example, staying away from Athena should probably be a priority) but more often than not, Point is where he belongs. Ash is an interesting matchup to deal with as Kensou, especially since Ash's style can change drastically from point to anchor. While Point Ash will probably be the most relevant to know, since Kensou will likely also be point, depending on if you're OCVing or if you had to switch order due to matchups, it helps to know Anchor Ash as well. Against Point Ash, it's basically an SF styled match. The FB matchup is tough, and if you have no meter, you will not win it, but his FB's aren't that tough to get around, especially the A versions. Just play it safe, don't do anything too reckless. Once you have meter, it's quite easy to win, just wait for him to try his C FB, and you have a free in with damage. Now, when he's waking up or when he's crouching, please don't jump at him, it's an easy Flash Kick especially considering Kensou's floaty jump. Any other time though, and you can annoy him. It's pretty much a battle of attrition and getting in on him on point. Once you do, as long as you're aware of Flash Kicks, it's not a tough victory. ANCHOR Ash however is a different story. When he has 2 meters, NEVER JUMP, EVER, lest you want to take a Sans-Culotte to the face for free. You definitely won't be winning the FB battle, and getting in on him is insanely tough due to one mistake leading to S-C. If you can, try to bait out, to gain a decent punish, but even if he misses it, he's not weak. Now he has standing Flash Kicks that lead into combos. God forbid he lands Germinal on you, if he does, turtle for your life until it wears off. This page was last edited on 15 December 2014, at 20:17.